The weather in my area is all over the place. It has been cold, warm, foggy, rainy, but not in any way snowy and winter-like. This weekend the temperature is supposed to hit 70, in January! Normally this is the time of the year when I am bundled up in blankets drinking hot drinks and making soups. This year I am still making lots of soups and crock-pot recipes, but the weather feels more like spring than winter. Regardless of the weather I love my slow cooker. As my boys get older and my time feels more and more crunched my slow cooker has saved me many times. I never understood before having kids how hard it can be to get dinner on the table with two boys running around causing chaos. Now I know better and try to make at least one meal a week that is quick and easy. This week I tried a new recipe for Slow Cooker Pot Roast from the January 2013 issue of Family Circle magazine. This recipe has 11 ingredients. It takes 8 and a half hours of total time, 30 minutes of which is active and makes 4 servings. I would have normally used a chuck roast for this recipe, but in my effort to use things out of my freezer I used the beef cut that my mother-in-law had bought me this fall. The recipe uses 12 ounces of small potatoes, but I chose to use the full pound bag that I bought at the grocery store. Additionally, I chose to leave the potatoes whole instead of cutting them in half. Since I eat gluten free I used cornstarch for the pan sauce and gluten free Worcestershire. Even if you can eat wheat flour I prefer cornstarch since it does a better job at thickening. I followed the remainder of the recipe as written. Since I didn't use the best cut of beef in this recipe the sauce really made the recipe. The pan sauce was delicious and made up for any shortcomings with the beef being slightly tough. I did wish that there were more vegetables. There was only enough for exactly 4 servings, which was barely enough for my family. If I was to make this again I would double the amount of vegetables and buy a larger roast. This recipe is not currently available on-line. It can be found in the January 2013 issue of Family Circle. 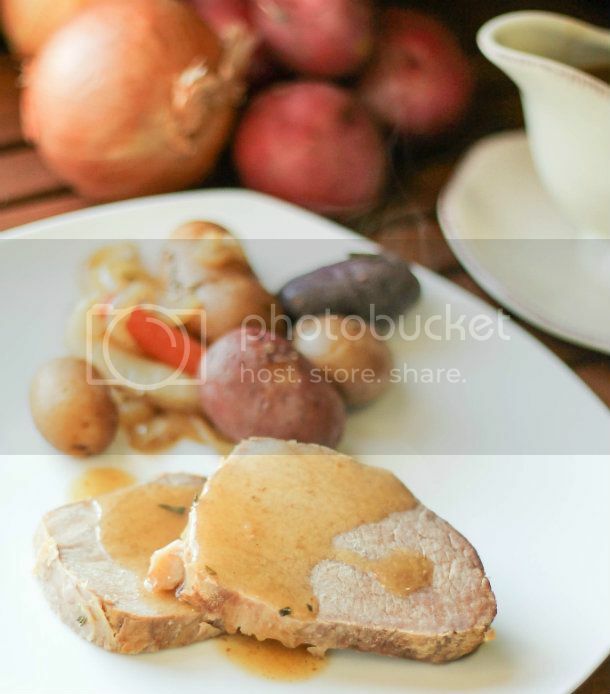 Here is another Slow Cooker Pot Roast recipe from Family Circle. Hmmmm? My pot roast doesn't come out looking like that when I make it in my crock pot LOL. Pot roast is a family favorite around our house - especially in the winter time. Yum. Thanks :) I look forward to making some of your delicious recipes! I love crock pot cooking and will def. try this! I'm your newest follower! I love my crockpot also, it's awesome :) Followed you back! Hope you'll stop by, I'm having a link party today as well. I love finding new food blogs :) Come back again soon! Oh I love slow cooker meals! That looks delicious! Just found your cute blog through the blog hop. I'm a new follower. Hope you'll stop by sometime! I love slowcooker meals also, they are so quick and easy! Going over to check out your blog :) Come back again soon!